NOCN is at the forefront of the apprenticeship reforms, working in partnership with employers, FE colleges, training providers and skills experts in Trailblazer groups to develop a range of standards and assessments for new apprenticeships. Once a new apprenticeship standard is approved by the Government, an apprentice assessment organisation (AAO) is appointed to carry out the end point assessment (EPA). For an organisation to become an AAO, it must meet high standards of quality and competence. Employers must choose their AAO at the start of their apprenticeship programme. Independent End Point Assessment (EPA) from NOCN ensures that all apprentices have the Knowledge, Skills and Behaviours detailed in the apprenticeship standard. NOCN is a leading Government approved, independent Apprentice Assessment Organisation (AAO), working with employers to ensure high quality, valid and robust EPA. 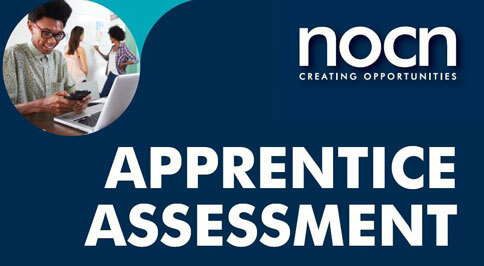 NOCN has more assessments plans in process and our approach to assessment can be applied to all apprenticeship standards with specific adaptations where necessary to meet the requirements of each job role. The apprenticeship will vary in duration, from 12 to 24 months, possibly longer. The formative assessment will be supervised and delivered by the registered training provider and employer. Once the apprentice is judged to be ready they will be put forward for their EPA - a point known as their assessment gateway. The EPA will be provided by NOCN as the AAO and will vary as indicated depending on the nature of the job.